It cuts and scrapes; it peels and notches. It slits and marks; it’s a floor wax and a whipped topping… oops, wrong product. It’s Two Cherries’ new 2Cut. It may look like a chisel, but they claim it’s a universal tool for the craftsman as well a the do-it-yourselfer. Like its name implies, the 2Cut has two different cutting edges: the 26 mm front edge like a regular chisel and the 90 mm long side edge for cutting use. The remaining side edge can be hit with a mallet. Two Cherries hardens the entire blade in a salt bath to achieve 60±1 RHC and polishes both cutting edges until they’re mirror bright. Made in Germany, the 2Cut comes with its own micro-fiber holster to keep it safe. Its suggested retail is $58, but the only place it’s listed online is Dieter Schmid Fine Tools, where they’re charging €30 ($44) before shipping. 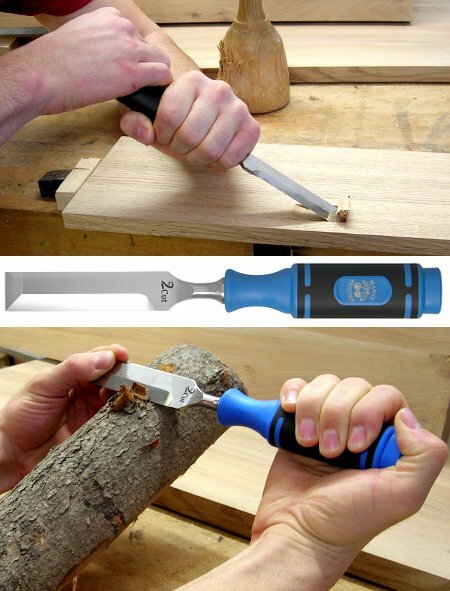 See that third picture….. that guy will find out why this is such a bad idea when he hits a knot and his left hand slides through that chisel blade. Also, $44 is a bit steep for ANY chisel! Wow. Table saws are unsafe, but some companies are out inventing new ways to get injured. My thoughts exactly Dreamcatcher. I had to take my brother to the doctors a couple months ago due to a chisel accident. And that was a regular chisel. They are SHARP! I use all of my knives 2-handed this way. Is this chisel/knife fixing a problem that had been crying out for a solution? I’m not feeling the vibe. An old friend ground a tanto type tip on his Frosts sheath knife and swore it was the best thing he ever did. At the very least, it’s a stronger tip than the stock one. In my home shop – I have a fair collection of 2-Cherries (Kirschen Werkzeuge) carving gouges which I use and like very much (sharpen up very well and hold an edge)The design and execution of their carving gouges is first rate. From the looks of the tools pictured here – its hard for me to say the same. Also – and maybe it’s just the way I work – in both those pictures he’s holding the blade upside down. I agree with others who say this is a dangerous tool. Need a draw chisel? Buy a real one! I guarantee that this tool is the brainwave of some marketing jackass who’s never used a chisel. Probably the CFO’s nephew. Why the hell does every company need to out-stupid their competition? Can’t Two Cherries just continue making good chisels? Now that Marples has been Irwin-ed and sent to China, wouldn’t TC be in a better spot in the premium chisel market? Available at a Lowe’s near you. A list of emergency rooms in your area is helpfully printed on the back of the blister pack. And here I thought those combination chisel/files were a bad idea. This tool will give a whole new meaning to “Hand Carved”. How about just a four edged piece of metal, razor sharp on all sides? That would be twice as good! @ Bill: FingerSlice 2000 – haha! seriously. that first picture makes me wonder what the hell he thinks he’s doing. the third picture is just absolutely terrifying. it should only be published if it is in back of the big red circle with a line through it. Whassamatta? You don’t think a mortise (or whatever the heck that is supposed to be) shouldn’t just be scooped out without being scribed, marked or anything? I wonder if they were going to use the publicity photo to show him paring the tenon since it looks like there is a deep cut in it. Maybe they wanted to show him paring his TENDON. lol, get it, tendon? Oh, nevermind…. Seems to me far, far safer to have two different tools, each one fit for its job. I don’t see the problem. Just use them with care!